Block Island National Wildlife Refuge Quarter Three-Coin Set (front and back). This product is the last of five for 2018 and the forty-fifth overall in the U.S. Mint’s series of America the Beautiful Quarters Three-Coin Set™. This collectible honoring the national site in Rhode Island debuts today, Nov. 27, at Noon (ET) for $9.95. 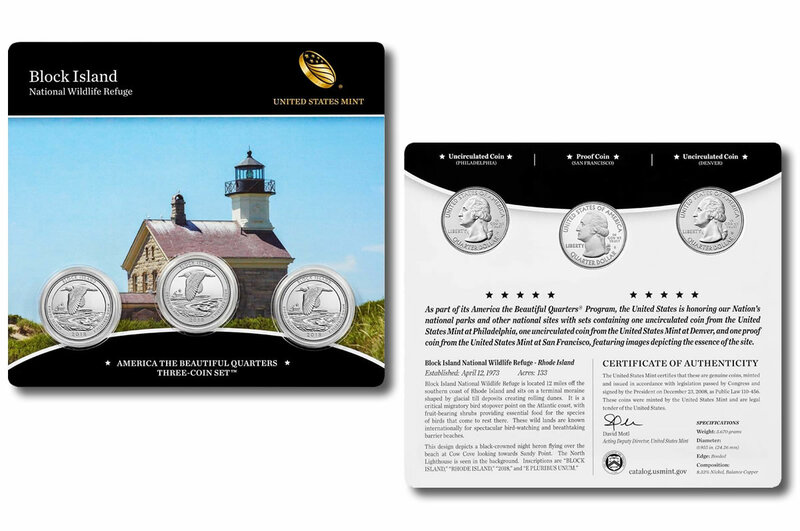 Included in each set are three Block Island National Wildlife quarters issued as part of the U.S. Mint’s America the Beautiful Quarters® Program. The quarter in circulating quality was released in large quantities on Nov. 13 and was officially introduced to the public on Nov. 15.
one proof quality quarter from the San Francisco Mint. Shown above are several CoinNews photos of some collectible versions of 2018 Block Island National Wildlife Refuge Quarters that were released in earlier products. 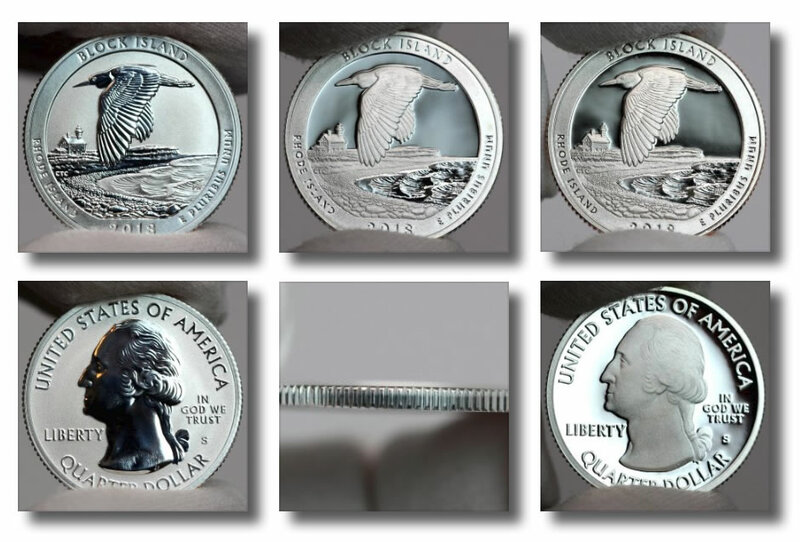 They include reverse proof, proof and uncirculated quarters. Their reverse image was designed by U.S. Mint Artistic Infusion Program Artist Chris Costello and sculpted by U.S. Mint Sculptor Phebe Hemphill. Obverses (heads side) bear the effigy of George Washington as found on all other coins in the series. This likeness of the first President of the United States was originally designed by John Flanagan and has been appearing on quarter dollars since 1932, with some alterations. Obverse inscriptions read: "UNITED STATES OF AMERICA," "LIBERTY," "IN GOD WE TRUST," and "QUARTER DOLLAR." In addition, there is one mintmark indicating its facility of production — ‘P,’ ‘D,’ or ‘S’ for Philadelphia, Denver or San Francisco. Coins of the set are attached to a plastic card that includes a photographic background of North Lighthouse in Block Island National Wildlife Refuge. The card also contains a brief description of the refuge and a certificate of authenticity. 2018 Block Island National Wildlife Refuge Quarter Three-Coin Sets may be ordered directly from the U.S. Mint along with other America the Beautiful products on its website, located here. Orders may also be placed by calling 1-800-USA-MINT (872-6468). Those interested in obtaining some of the previous America the Beautiful Quarter Three Coin Sets may also find what they are looking for on the Mint’s website. Sets dating back to 2016 are currently available. Figures show their sales range from about 11,250 to 16,940. A CoinNews photo of this year’s first three-coin set with quarters emblematic of Pictured Rocks National Lakeshore in Michigan. It has sales of 14,217 through Nov. 18. Coins of this set and others are struck and issued by the U.S. Mint as part of its America the Beautiful Quarters® Program. The series debuted in 2010 and features five new quarters annually with each celebrating a different site of national interest. One site for the program was chosen from each state, the District of Columbia and the five U.S. territories. 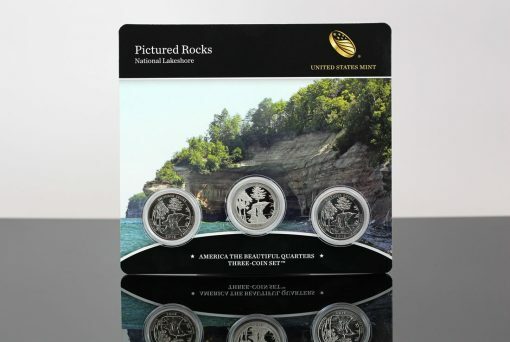 More recently, the first set released this year included quarters honoring Pictured Rocks National Lakeshore in Michigan. Going forward from there, the second one offers coins commemorating Wisconsin’s Apostle Islands National Lakeshore, the third set features quarters celebrating Voyageurs National Park in Minnesota, and the fourth one has quarters honoring Georgia’s Cumberland Island National Seashore.